The American Crawl : Announcing Good Reception! 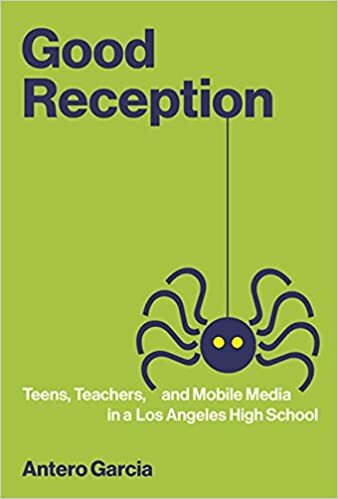 I am thrilled to announce the release of my newest book, Good Reception: Teens, Teachers, and Mobile Media in a Los Angeles High School. Published by MIT Press, this book synthesizes nearly a decade of research that began in my classroom as a teacher in Los Angeles and continues through various work today. A year in the life of a ninth-grade English class shows how participatory culture and mobile devices can transform learning in schools. Schools and school districts have one approach to innovation: buy more technology. In Good Reception, Antero Garcia describes what happens when educators build on the ways students already use technology outside of school to help them learn in the classroom. As a teacher in a public high school in South Central Los Angeles, Garcia watched his students’ nearly universal adoption of mobile devices. Whether recent immigrants from Central America or teens who had spent their entire lives in Los Angeles, the majority of his students relied on mobile devices to connect with family and friends and to keep up with complex social networks. Garcia determined to discover how these devices and student predilection for gameplay, combined with an evolving “culture of participation,” could be used in the classroom. Garcia charts a year in the life of his ninth-grade English class, first surveying mobile media use on campus and then documenting a year-long experiment in creating a “wireless critical pedagogy” by incorporating mobile media and games in classroom work. He describes the design and implementation of “Ask Anansi,” an alternate reality game that allows students to conduct inquiry-based research around questions that interest them (including “Why is the food at South Central High School so bad?”). Garcia cautions that the transformative effect on education depends not on the glorification of devices but on teacher support and a trusting teacher-student relationship. I’ve taken the years since first completing the analysis at the heart of this book to look at how my work can shift the landscape of educational equity in the U.S. As a result, I’ve had a chance to extend the research that first began as my dissertation in this book. At the same time, I’ve tried to fill this book with as many resources for teachers, researchers, and game designers as possible. The appendices has resources for structuring game design for K-12 contexts as well as frameworks for meaningful integration of technology in schools. If you want to get a better sense of this work, Henry Jenkins recently ran a three-part interview with me describing some of the key ideas in the book. Take a look at parts one, two, and three. Good Reception is a project I’ve spent a long time refining my thinking about. I began this research a few years prior to one of the largest one-to-one debacles in the U.S. and concluded my analysis only after co-designing a school based on some of the principles featured in the book. Further, this work in the book has shaped how I have been studying project-based learning, tabletop gaming, connected learning, teacher professional development, “analog” and “gaming” literacies, research methodologies, and alternate reality games. Though I write about a lot of this stuff in a lot of different journals, Good Reception is where I’ve tried to be most accessible in my writing for a more general and public audience. I hope you give it a look! A rising star in the Digital Media and Learning realm and a gifted storyteller, Antero Garcia combines an embedded perspective as a classroom teacher facing the challenges and opportunities of bringing mobile media into the public schools with a theoretically sophisticated grasp of contemporary pedagogical theories (Connect Learning, the New London Group, games-based education, and Paulo Freire, among others). This book could not be more timely or more urgent as schools confront a growing disconnect between their normal practices and the ways youth are processing the world around them. As technology sweeps into classrooms, adults commonly regard it either as a magic bullet to deepen student engagement or as a hard-to-handle and persistent distraction to be put away. Instead, Antero Garcia, a gifted teacher, presents in Good Reception, a nuanced, alternative, and illuminating perspective, based on listening to the students themselves about their relationship with technology. I’m really excited to have this work out in the world. If you’re reading, talking, or wondering about this book or the ideas within, please feel free to get in touch! Posted by antero on Thursday, November 2, 2017, at 5:00 pm. Filed under education, literacy, Technology. Follow any responses to this post with its comments RSS feed. You can post a comment or trackback from your blog.